What is an HOA or homeowners association? Fundamentally, an HOA is a body that sets rules and restrictions for people that belong to neighborhood communities for the benefit of the community as a whole. These communities can take several forms, and it is generally a condition of purchasing a home in such communities that you join the HOA. An obvious example is a condominium, where you would own the inside of the condo, but neither the fabric making up the structure nor the common services and amenities provided. Another example is a gated community, where residents are responsible for the maintenance of everything within the gate: sidewalks, lighting and security being just three obvious examples. Others may be landscaping, communal facilities such as fitness rooms and pools, and also rules such as pets and noise. There are several other types of community that can form such an association, including leased land property and new housing developments with common shared areas such as tennis courts that are the residents’ responsibilities. Here are some basics to explain how they work and how they can be set up. To set up an Association you must first establish your state’s property code, and are advised to use a real estate attorney or even contact your mortgage advisor. The developer, if appropriate, must agree and will likely also help you with the process. The HOA must be set up as a company, and you will first have to form a board of at least 4 members with the usual officers: chair, secretary and treasurer. It is important to contact every member of the community and get them involved, because if membership was not a condition of purchase you could have a problem if any disagree. This is why using a lawyer experienced in this type of work is important. Homeowners associations are set up with non-profit articles of incorporation, conditions and restrictions and bylaws that apply to the area or communities involved. There will be a board of directors, and each homeowner will make monthly payments to the HOA treasurer. If you intend purchasing a home in a neighborhood with an HOA, make sure you fully understand its bylaws and what you can and cannot do with your home before purchasing. If you are purchasing a home, and the property you like is situated in an existing HOA area, there are certain things you must establish before signing any contracts. Restrictions may apply on the color of your exterior decoration (doors, windows, fences, walls, etc), and even whether or not you are permitted to dry your washing outdoors, have a real log or coal fire, the size of your satellite dish (or even if you are permitted one), whether you are allowed pets, and if so what species and size. Many do not allow cats, while yappy dogs may also be frowned upon. There are many other potential restrictions, such as the design and size of fences and hedges, the type of blinds, shutters or drapes permitted on windows overlooking the street and whether or not you can park your car in the street or even in your driveway. These are just simple examples, and most communities have reasons for applying them. They generally tend to enhance the look and peacefulness of a neighborhood, and most are not overly restrictive. Make sure you know what the HOA rules are in your neighborhood before making a decision to purchase a home. Restrictions on external décor and dimensions of fences and hedges. Must you keep your garden or backyard tidy? Are you allowed a barbecue in your backyard? Can you park in your driveway – many do not allow certain types of vehicle. Can you install solar panels – some HOA agreements o not permit these. Does your HOA have the power to approve or reject projected home improvements, such as adding a conservatory or extra garage? What is an HOA in a neighboring community doing with regard to the above – is yours average, lenient or strict? What happens if you break a rule? Can the HOA foreclose if you miss payments? There are many more aspects of your HOA that you should establish before deciding to purchase a property. One of these is how the HOA is managed – is it strict or lenient? Another is whether there are personality clashes within the board, and how that might affect decisions made that could affect you. A homeowners association can benefit a community if run efficiently. An HOA can benefit you in many ways, particularly in maintaining the look of the district and the amenities available to your family. The vast majority believes them to enhance their community and help to develop a genuine community spirit. a) How much of a deposit are you able to pay? b) How much can you afford to pay each month? The way your potential lender will work out how much to lend you is different to the way you will calculate how much you can afford to pay. Sometimes the lender will offer you more than you expected, and at other times will offer less and leave you unhappy. So what’s the difference? Let’s first look at how you might work out how much you can afford. Mortgage Affordability: What Can You Afford to Pay? Don’t look at your dream home, get the price, and then figure how you are going to afford it. People are very good at making themselves promises to economize, stop going out and eat frugally to afford this fabulous home – but they are also very good at failing to do these things and ending up in serious financial trouble, terminating in repossession and eviction notices. Work out what you can afford to pay each month without making promises to yourself that you know you will ultimately fail to keep. Take the gross (pretax) income for your household, and you should be able to afford a monthly mortgage repayment of around one third of that. So if you and your partner, say, earn $4,800 between you, then you should be able to afford a monthly mortgage repayment of $1,600. However, if you have other debts such as credit cards and student loans to pay, you should take these into consideration. If you work to about 40% of your gross income as debt, then that should work fine for you. Keep in mind that you can claim tax relief on your mortgage interest payments so once you agree a mortgage make sure you know how much you are paying each month in interest and how much is coming off the principal. What Does the Lender Think? 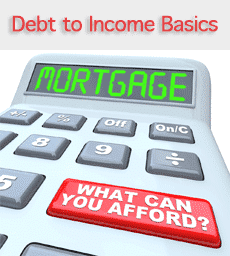 Lenders evaluate your DTI or debt to income ratio. This is the ratio of your total debts to your income, so if you make $4,800 monthly and have debts of $1,730 your DTI is 100×1730/4800 = 36%. Your lender splits this into two components: the total DTI and the proportion of that which is connected with your housing. That can include your interest and principal payments, any property taxes, any homeowner’s insurance payments and anything else connecting with buying your home such as any payments to a housing association. If you are renting, it includes your rent and any regular maintenance payments. No more than 28% of the household’s monthly income should involve the housing component. Also, lenders like to see no more than 36% DTI. So if your household earns $4,800 monthly, you should be given a mortgage if your total debts are no more than $1,730. Since no more than 28% should be used for housing, you can get a mortgage where your total housing costs, including repayments, insurance, etc, are no more than 28% of your $4,800 = $1,344 ( a bit less than the $1,600 estimate above). That also means that your other debts should be no more than 8% (so all debts = a maximum of 36%) or $384 monthly. Using that example, you should be able to work out how your mortgage affordability, or much you can spend on your mortgage. Obviously, the lower your other debts, the more you can afford for your home to a maximum of 28% of your total monthly pre-tax income. That’s the way your lender calculates it, which is not the same as you would have done. It is important to understand how your mortgage lender thinks in order to make sure that you meet their requirements. To answer the question, ‘How much home can I afford,’ you can work out you mortgage afordability using that $1,344. If the current mortgage interest rate is 4%, and you pay around 2% annually for taxes and insurance, you can afford to pay in the region of $200,000 for your home. You would have to check with your choice of mortgage lender or building society for exact amounts. 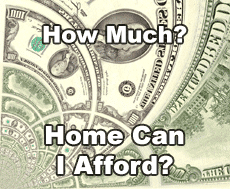 We can help you understand how much home you can afford with a FREE consultation. We can also get you up to date on where mortgage rates are and which loan programs fit your needs the best. Fundamentally, your debt to income ratio (DTI) is the percentage of your income that is used to pay your debts, and is often abbreviated to the ‘debt ratio.’ Your ‘income‘ is your total gross income from all sources before tax, and the ‘debts‘ cover everything that you are currently repaying. This means that 36% of your total gross income is used to repay your debts. In the USA and some other countries it is common, but not essential, to present debt to income ratios using two figures, known as the ‘front-end’ and back-end’ ratios. While the above 36% is useful to lenders, it is even more useful to separate the payments made to the individual’s current home costs from their other debts. To make this clearer, let’s consider another set of figures. The front-end ratio relates to the income spent on housing costs, including the mortgage repayments, rental payments, housing taxes, home insurance, mortgage insurance and so on. In the simplified example provided, this sum totals $1,070 each month. The rest of the 36% involve costs not associate with your home ownership or rental. Taking this figure and calculating the debt to income ratio for that, it comes to 100×1070/4500 = 24% (to nearest whole figure). The DTI here would then be expressed as 24/36. The lender now knows that 24% of the 36% DTI is related to your home, and only 12% to other debts. This is important because it gives the lender an idea of your debts unconnected to your home ownership or rental. Speaking generally as diffferent lenders vary, one lender might insist on a figure of at least 28/36, so that the above person would not qualify. With a DTI lower on the front end, it means that there are more debts other than for housing. This would have a negative effect on your likelihood of being offered a loan or another mortgage. It is important that you start by getting an accurate indication of your current DTI. Then you should work on paying less each month on your non-housing related debts. Reduce your credit card payments, pay off your auto loan(s) and try to clear as many other debts as you can, or at least negotiate reduced monthly payments. It is not your total debts that lenders are concerned about, but with how much income you have available after paying the monthly repayments for your non-housing related debts. They want to get a feel for whether or not you can afford the added burden of a monthly mortgage payment. They know the rough cost of living in your area, and will apply a debt to income ratio appropriate to what they believe you will have left after paying your other debts plus your living expenses. Where Is Your Debt to Income Ratio? For a FREE rate quote and an evaluation of your current debt to income ratio and ability to qualify for a new home purchase or refinance, please call us at the number above. We can also help you understand what loan programs are available and which ones makes the most sense for your needs. 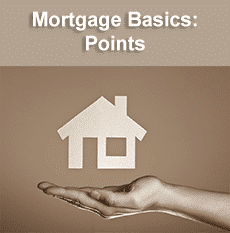 Comments Off on Why Pay Points on a Mortgage: Are Points a Benefit or Not? Why pay points on a mortgage, and how do they benefit you? Points are a typically American arrangement, and refer to payments made in order to receive a lower interest rate. They have certain advantages, although these are not universal. Here are some details on mortgage points, and how they can be used to your advantage. Some people get confused between their deposit and the subsequent points payment. The fundamental difference between the two is that the deposit is typically mandatory, while points are not, and tend to rise in 1% increments. Once you have agreed the loan details and paid the deposit, you might then be offered the opportunity to reduce the agreed interest rate by paying points on the mortgage. For example, once your loan has been complete: you have paid the deposit and have agreed to a specific interest rate, whether fixed or variable, you may then be offered points. For each 1% of your mortgage loan you pay in cash, you will be offered a corresponding reduction in your interest rate. In many cases, mortgage rates are quoted including points, the base rate not being quoted unless you refuse points. For example, if you are offered a mortgage of $200,000 at 7.5% and 2 points, you may have to pay 8% interest if you refuse to buy the points. If you pay extra points over and above what is offered, your interest rate will reduce accordingly. For example, if you borrowed $200,000, two points would be 2% of that, or a cash payment of $4,000 to get the 7.5% rate. You have no obligation to pay points, and there are certain circumstances in which it would be wrong to do so. Keep in mind that your points agreement only last as long as the mortgage does, so if you change homes fairly quickly, or decide to refinance, your points agreement is terminated. Should I Buy Points or Not? You should pay points on a mortgage if you have a relatively low income, but a good lump sum to use to pay for the points. If you can afford more than a 20% deposit, you should use the extra to purchase points rather than reduce you principal sum borrowed. Using the example above, on a $200,000 loan you will pay simple interest of $16,000 in a year at an 8% interest rate. You would pay $15,000 at 7.5% interest, saving $1,000 each year. Yes, interest reduces as your principal reduces, but not by much over the first few years. By paying for 2 points at a total of $4,000, you would make that sum up after approximately 4 years and benefit thereafter, this is known as your break even point. If you paid that $4,000 as payment off the principal, you would save around 8% of that each year, or $320 – losing $680 every year in relation to points. If you intend selling your house or moving on within 4 years, it does not make sense to buy points because you would spend more than you gained. Otherwise it does – in this example. So Why Pay Points on a Mortgage? The simple answer is to save money over the longer term. The longer the term of your mortgage, the more you gain by buying points. If you are short of cash when you purchase your home, but expect to earn more later, then points don’t make sense. But if you are cash-rich for a short while (an inheritance or medium lottery win), points can help you pay less for your home, or purchase a better home for what you can afford with your current income. Pay the minimum of a deposit and the maximum points you can afford or are offered if you are keeping your home for a long time. Still Have Questions About Points? We can help. For a FREE consultation about point or any mortgage questions you might have, feel free to call us directly. We can help educate you on what loan programs are available and get you an up to the minute mortgage rate quote. 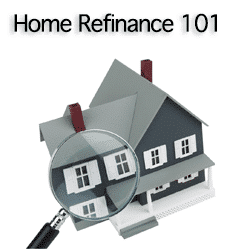 Comments Off on Refinance Basics: Should You Refinance Your Home? Should you refinance your home? Since we can only speak in regards to refinancing on a general basis, before you make a decision to refinance your home you should be sure to speak with a mortgage professional. Everyone’s circumstances are different, and what applies to one person might not apply to you. Before making a decision to refinance you home, or any other property you own, you must first be fully familiar with the three fundamental aspects of acquiring a new loan to replace your existing loan with your home as security, which is what refinancing is, by definition. You should not refinance your home to save money if the interest rate offered is greater than that you are currently paying with your existing mortgage. If you simply want some cash to pay for home improvements, then shop around for the best interest rates you can get, because there is a fine line between refinancing and a secured loan. Another aspect of interest rates to consider is that if you have your mortgage for a long time, the bulk of your current payments will be used in reducing the capital. Initially, you are paying a lot more in interest than in capital, but as your capital sum reduces, so does the interest. If you refinance, you will likely be back to paying more on interest than repaying the actual loan. Against that, of course, is the fact that your equity would reduce the sum borrowed, unless you want to include the ability for home improvements such as a new kitchen or a room addition. The term, or length of the loan period, will impact upon both your payments and how able you are to maintain them. You can refinance over whatever period your lender is willing to offer you up to 30 years, depending on your age, ability to pay and the equity on our home. You will be informed of the fees in advance, but the cost of fees involved may play a role in the decision making process and whether or not your new rate is low enough to justify refinancing. Divide the fees by your monthly saving to find your break even point, and find out how long it will take before you are actually begin saving money. Let’s say you refinance your home and save $88/month over your existing payments. If the fees, including the closing costs of your existing mortgage, totaled $3,000 it would take 34 months before you are actually saving money. If the closing costs were $6,000 (which is not unreasonable), you would have to repay for 68 months before you would be saving money over your existing payments. Take the fees, including the closing costs of your existing mortgage, interest rate and repayment period into consideration, and figure out how much you will be repaying in terms of the finance provided. Perhaps an extended term would enable you to afford a sum you could not repay over a shorter period. Before you refinance your home, be sure to view your Good Faith Estimate to insure your fees are in line. There are a variety of factors (as mentioned above) that come into play when deciding if refinancing your existing home loan makes the most sense for you. Still have questions? We can help. For a FREE consultation, please call us at the number at the top of the page. We can help you understand if refinancing makes sense for you and help educate you on which programs makes the most sense for your needs if refinancing fits your current situation. 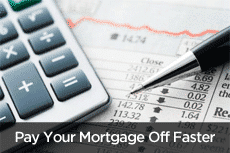 Comments Off on Mortgage Lock Basics: Should You Lock-In Your Mortgage Rate? A mortgage lock can work for you or against you depending upon the terms of the mortgage rate lock in period and upon the current behavior of the economy as seen in the equities and bond markets (stock markets). Because these are common variables, it is not always easy to provide a definitive answer as to whether or not a rate lock makes sense. However, the following discussion should give you a better understanding of the components involved in trying determine whether or not locking in your mortgage rate is the best move for your specific circumstances. First, it is important that you understand what it means when discussing a mortgage lock, and what benefits you can expect by locking in to a certain mortgage interest rate. What is a Mortgage Lock? In simple terms, you lock in your mortgage agreement to a specific agreed interest rate for an agreed period of time while your mortgage application is being processed. It is fundamentally an assurance that once you have agreed an interest rate with your mortgage lender, that rate will neither increase nor decrease until your mortgage papers have been signed. You can also include the points when you lock in your mortgage, although this is not mandatory. The ‘points’ refer to lump sum charges you can pay to reduce you interest rate, and one point is generally equivalent to 1% of the sum being loaned – i.e. 1% of your mortgage. So if you borrowed $200,000 to purchase your home, one point would equal $2,000. Should You Lock Your Rate or Not? Given that your mortgage can take a few weeks or more to complete once you have made your offer backed up by a mortgage from your bank or building society, you will usually not lose with a mortgage lock, although much depends on the financial situation at the time. In a highly inflationary period, when interest rates are generally rising, it makes sense to lock-in your mortgage to an agreed rate. However, if you are buying your new home in a recession, and prices are generally stable, interest rates tend to drop, and it might be to your benefit to hold out for a lower interest offer. You are not restricted to what you accept, and you can usually ask for a mortgage lock at any time during the process. In a recession it is likely best to keep your options open and not lock in your interest rate until you see a trend – either up or down regarding interest rates. However, your lender will be doing the same thing, and is unlikely to agree to lock into an interest rate that is liable to increase over the short term. 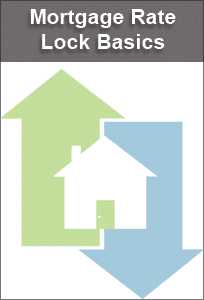 To take full advantage of a mortgage lock, you are best advised to work with a mortgage professional that has a day in and day out working knowledge of the markets and latest mortgage rate activity, and accept a lock in mortgage rate if you believe that existing conditions appear to indicate a future rate increase. How Long Does a Mortgage Lock Last? Mortgage rate locks can typically last around 1 to 2 months. This depends on the lender, and some might hold the interest rate for only 7 days after approval of the loan. Others might go longer – to 120 days or more. Establish the period when you arrange it and make sure that you understand and agree to the terms of the rate lock. Your lender might charge a fee for a mortgage lock, in which case this sum will likely increase with an increasing amount time for which the rate is held. The period should last until settlement, so before agreeing on a time period find out how long it generally takes for purchases to be settled in your area. The term ‘points’ refers to a means of reducing your monthly payments by paying a lump sum. Each point has a capital cost, and reduces your interest rate by a certain amount. You can also lock-in the value of each point to a fixed sum so that your lender cannot make up for any loss in interest payments by increasing the points charge. You can lock-in your points and interest rate or just take a mortgage lock with floating points. Before making this type of important decision, you should first seek the advice of an independent financial advisor who is on you side, and not working for your lender. Private mortgage insurance (PMI) is a form of protection for mortgage lenders in the event of borrowers defaulting on their payments. If a borrow takes a mortgage that is more than 80% of the purchase price of their home, then they must also purchase mortgage insurance to protect the lender. In other words, you need PMI if your down payment is less than 20% of the selling price. In some cases, the value of your home may be appraised if the lender feels that the price you paid is not representative of its true value. Because its purpose is to protect the lender, the insurance premium is based upon the amount borrowed, and generally set at 0.5% of the total mortgage loan for year one, and then decreases each year as more of the principal is paid. The lender is paid if the borrower defaults on the loan. 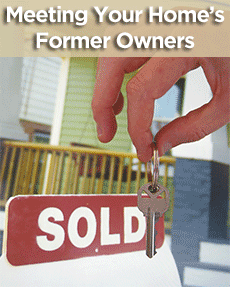 Those with lower income or less of a deposit available can become involved in home ownership. People with little savings can purchase their dream home with a low deposit. Once you owe less than 80% of the total purchase price you can elect to cancel the PMI assuming that you are paying the premiums and not the lender (more on this below). Your monthly private mortgage insurance payment can be integrated into your mortgage repayment, so you make the one monthly payment to your lender that includes an additional sum for the PMI. You can make an annual lump sum payment, or even pay a single lump sum to purchase the insurance policy for the life of its term. The lender can pay the PMI for you, and then claw the money back by means of an increased interest rate. Whichever of these options suits you best will be determined by your personal financial circumstances. If you have the lump sum to spare, then the one-off payment might be worthwhile. However, you have to balance that with the benefits of using the lump sum as part of your deposit which might avoid you having to pay PMI at all. If you have less spare cash, but can afford an annual payment, then that might be your best option. Many decide not to do that if they need the ready cash to furnish and decorate their new home. The lender-paid option might be attractive if you earn a good monthly income with prospects of advancement but have no spare cash. As your salary increases, the extra interest you are paying becomes less significant to your overall income. In fact, the interest you pay on lender-paid private mortgage insurance is tax deductible, providing another reason for taking this option. It is possible to cancel the policy once the amount you owe on the principal of your mortgage loan has reduced to below 80%. Even if the value of home has appreciated due to improvements this 80% refers only to the original loan. However, keep in mind that the vast majority of your initial mortgage repayments will be paying the interest charges, with very little being deducted from the sum you borrowed. This is the case with any repayment mortgage, and it could be many years before your principal reduces to below 80%: 10-15 years is not unusual for a 30 year mortgage. 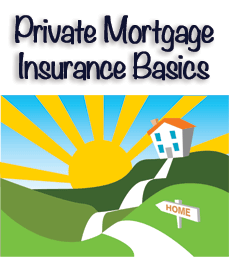 Private mortgage insurance is mandatory if your deposit is less than 20% of the purchase price. You may be offered options on how this is paid, and the most tax-friendly way is for the lender to include the PMI payment in your monthly repayment, when it will be tax deductible. Regulations can change during the lifetime of the average mortgage, and it makes sense to seek the advice of an independent financial advisor before signing any PMI agreement. Still have questions about how PMI works? We can help, simply call us at the number above for free mortgage and PMI advice! The question of whether to rent or buy is no longer a clear cut economic one. Many people who can afford to buy their home are choosing to rent instead because they no longer have confidence in home ownership. If you can’t afford your rent you move on, but if you cannot pay your mortgage you lose everything. Many renters have no plans to own their own homes, preferring to rent and invest their money in anything but real estate. While home prices are still dropping, foreclosures remain rising, and many are discouraged from purchasing their home. However, many analysts believe that house prices have bottomed and the time is right for buying. Those with the cash available for a good deposit are liable to benefit from purchasing homes while prices are low. Buying a home has been risky in years past since many home owners have lost money in their investments as home prices have fallen. That being said, real estate is an excellent long-term investment, and if you are seeking a home, then by purchasing when prices are low you will be both investing and buying yourself a permanent place to live. You can improve your home to suit yourself, while many rental properties cannot be changed in any way. However, by adding a new kitchen or bathroom, you will be adding to the value of your investment. You cannot do this with a rental, and every cent spent is basically wasted money that you will never get back. With a mortgage, you can usually expect to get every penny back due to appreciation of the value of your property. You also get mortgage tax benefit, and owning your own home is good for your credit rating. A major disadvantage is maintenance costs. If your roof starts leaking or your air conditioning stops working, you have to pay for the repair or replacement. However, with a rental, your landlord might go for the cheapest option while you can fit your own home with a more energy efficient system to save you money on power costs. When you rent a home you having nothing to pay but the rent and consumables such as power. In fact, so many people are renting these days that landlords are offering incentives, such as flat screen TVs, free parking and reductions in the deposit. Many renters cannot afford high deposits, and this is a definite advantage to them. Depending on the city you live in, it could be cheaper to rent than to buy. However, the buy vs. rent debate is not all about economics, and many people simply like the freedom to move around the country as they please, renting as they go. It usually costs a lot less initially to rent than to buy a home, and purchasing a home is long-term commitment that many are not prepared to make. However, once your mortgage is paid your housing is free and you will likely own an investment that has appreciated! Or you can buy another property to live in and rent out your house. 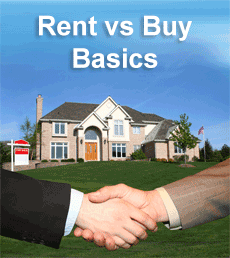 You have these options, while renting brings you no such investment benefits. Calculators are often used to establish the benefits of buy vs. rent, but the results can be misleading. Maintenance costs are often not included, and appreciation is always approximate at best and a guess at worst. Quite frankly, if you are confused and unsure of the best way for you to pay for your housing, then we can can give you specific advice based on your specific needs and circumstances.